Firewall manager is the Core-Admin application that will allow you to manage your server firewall. It can be used like to administrate the server firewall, or as a firewall acting as a router/gateway for your network. Firewall manager is based on iptables with a progressive load design, that includes and supports all the regular managment options of a firewall. Moreover, it has support for load balancing, label oriented rule management, change logs and easy support to create rules out of recorded blocked traffic. Interface rules, manage rules to control the traffic that goes in or out of the machine/device. This means, traffic that is generated from the machine or the traffic that is received by the machine (when acting as a server). Host groups labels: generally, it is recommended to define host groups, both source and/or destination in the “Host groups” section. This way you can use these labels to limit the source or destination that the rule applies. This way, the firewall managment is more maintainable and readable. At the same time, the firewall manager will update all the rules, selectively, when the content of the labels are updated. 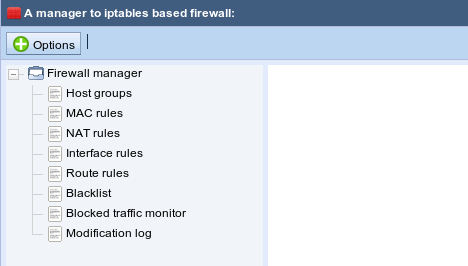 If the host groups are well defined, the firewall management is simplified. 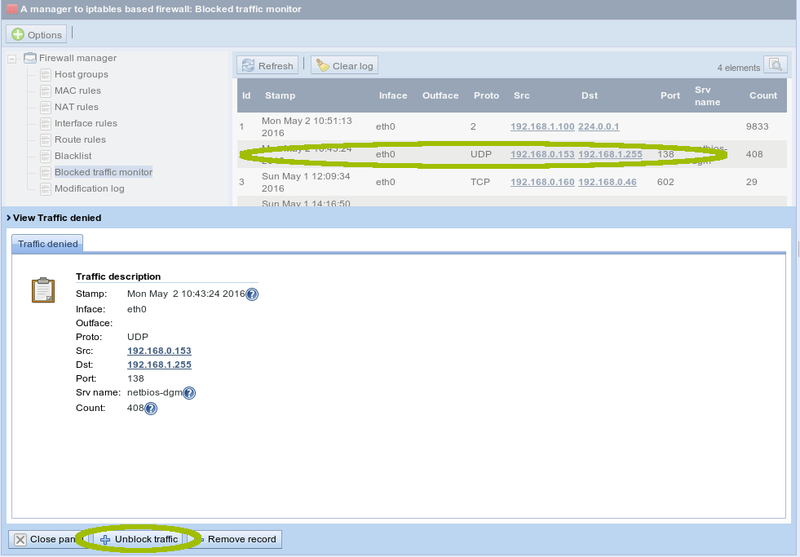 You only have to remove or add the ip address on those host groups to have your firewall properly updated. Default blocking, the firewall design works blocking by default. So, you will have to define the authorised traffic. It means a disabled-by-default policy. Easy traffic unblock, remember you can always go to “Blocked traffic monitor” section to visualise the traffic that has been blocked in the past. Once selected, you only have to click on the record your are interested in and ask for the rule creation, reusing proposed port, source and/or destination. We will explain this in detail later. Load balancing, will allow you to make your firewall to use two or more connections to balance the output. We recommend you to make everything work for one connection (default mode) and then activate the connection balance at the end. Firewall manager will install by default a basic rule set to ensure your server/device will be able to keep on working by detecting all common services. This may take a few seconds. After that, refine and personalise your firewall rule set. Modification log, where we can visualise a registry with all the actions done to the firewall. Next we will show different use cases to explain how to use Firewall manager. 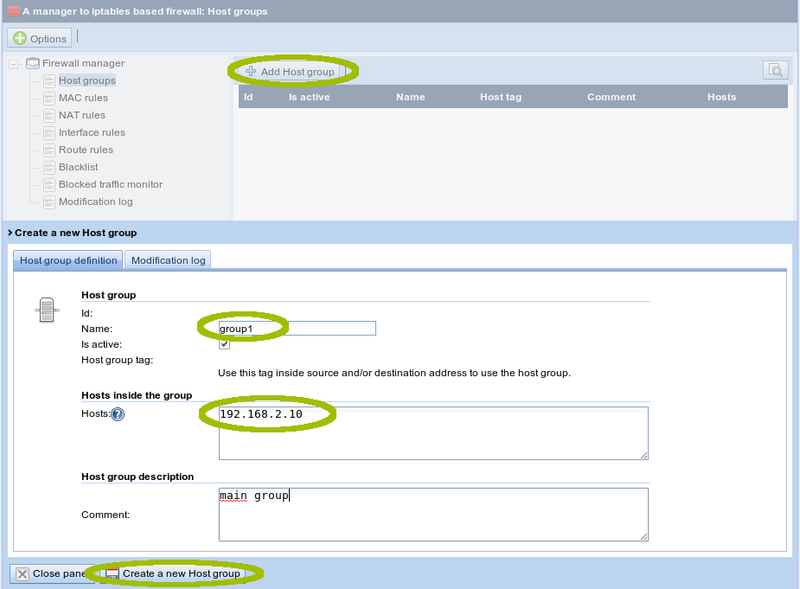 You can use host group tags like: [admin_ips] (see host groups section to setup host tags). next, we click on Create a new Host group, and that’s it. Allowed IPs, it will allow you to define the authorised IPs to be used from the MAC defined. If you do not input any IP, there will be no restriction and the MAC defined could use any IP. We can add a comment to identify the action. Next we click on Create a new Mac rule. Nat rules are only address rewriters, they do not authorise traffic. 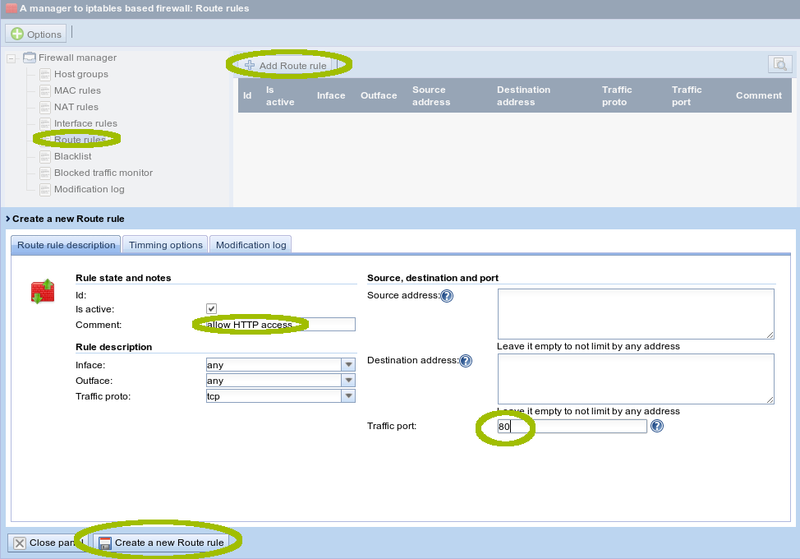 The traffic authorization is done after, in the interface or route rules sections, depending on the traffic you are authorizing. Next, we show some use cases for different NAT types. NAT to re-write the address of the packages coming out, it means, make the traffic appears like if the origin is the firewall. We configure this rule when we want the firewall/router IP to appear as the source address in all or part of the traffic going through or generated from the firewall. We set the NAT type like: “to source”. The NAT address (it must be a firewall IP). NAT for port mapping. This kind of NAT is used to be able to give access to internal services behind the firewall, for example a local web server. This way they can be accessible from the internet. We set the nat type like: “to destination”. Choose the option: Apply on inface to indicate where the conection will come in. 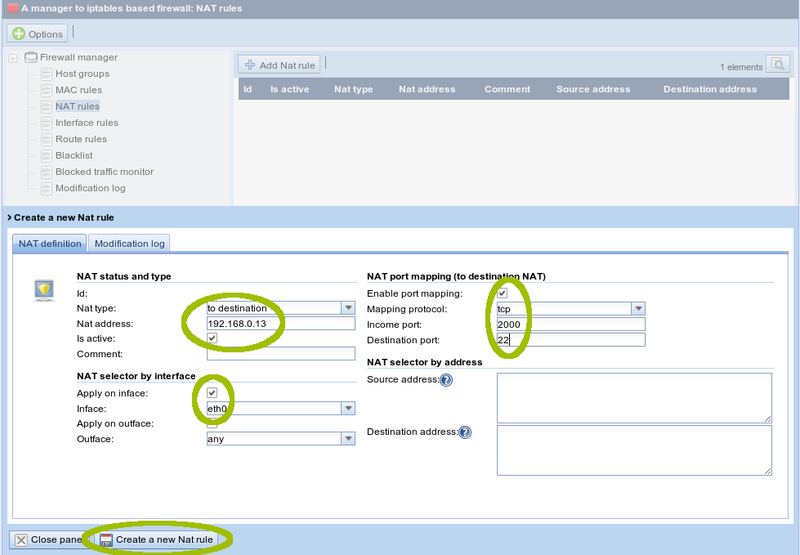 Once we have defined our basic NAT rules, both source NAT (“to source”) and destination NAT (“to destination”), you can do additional configuration to provide more security and control to your rule, by specifying the source address that would apply to the NAT rule added. Next an example is showed, where only the group “[authorised_ips_in]“ will have access because the NAT rule only apply to them. If the source IP is not in the host group, the NAT will not be applied and it will not have the authorization to access to the service. In other words, if the entries for Source address and/or Destination address are empty, the firewall will not apply any restriction neither in the source, nor in the destination. It is not necessary to configure both values, is just a option you might want to use. If you need to limit the NAT only in the source address or only in the destination address, just configure the values on those sections. 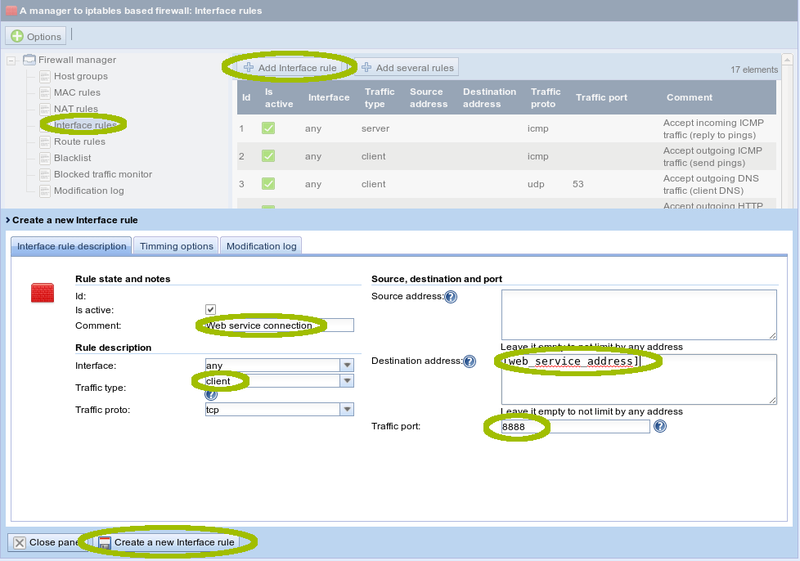 In this section you can configure all the rules needed to authorise the traffic that is coming in or going out of the server/device. If you are using a local firewall for a server (not for a router/gateway), then you will use this section frequently. client : they are all the rules to authorise the traffic that is origined from the server/device, it means, the server/device appear like a“client” of a external service. For example, if you need to authorise a ssh conection from a server to outside, then you need to create a “client” rule. server : they are all the rules to authorise the traffic that will be received in the server/device, it means, if you have a web service and you want to authorise to receive connections on it, you will create a “server” rule. Next you can find some examples about how to create interface rules. By default, all created rules are permanent. Optionally you have the possibility to configure a period over which the rule will be in place. For example, if you need to authorise the traffic for 2 hours, go to “Timing options” tab and write (in seconds) the time and change to temporal the rule type. To authorise the route traffic, you have to define, at least, on destination direction or directions, as well as the inface and outface. If you do not want to configure those interface, you can use the value “any”. 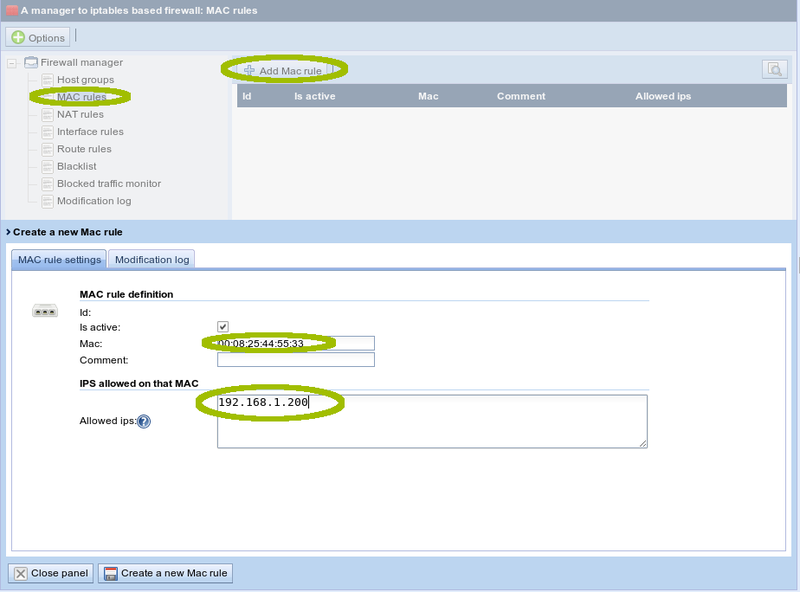 In this section you can find integrated the blocked IP database given by IP blocker application of Core-Admin. Read more about this section. The database is unified: if you make a modification in the firewall manager and it will be also available in the IP blocker application and vice versa. Allow a quick authorization by creating rules from the blocked traffic. In the modification log you have an history with all the interface, route, mac and nat rules as well as host groups labels that have been created / edit / removed, with the modified date and the author of them. Check out current Core-Admin editions available to see the one that fits your needs! Core-Admin 1.0.7673 ‘My name is human’ stable release is ready! Copyright © 2000-2019 Advanced Software Production Line, S.L.